Hamilton County Water and Wastewater Treatment Authority Executive Director Mark Harrison speaks with the Times Free Press editorial board in the newspaper's office on Thursday, Nov. 1, 2018, in Chattanooga, Tenn.
* The third public meeting on the proposed sewer plant is 5:30 to 7 p.m. on Nov. 8 in the Central High School gym. Some of the neighbors battling a proposed sewage treatment plant on Mahan Gap Road in Hamilton County have said they're willing to pay higher bills to locate the plant elsewhere. But higher bills are coming no matter where the plant goes or even if it's never built, the director of the county's sewer authority said. The Water and Wastewater Treatment Authority expects to increase spending by tenfold in coming years on rehabilitation projects to stop sewer overflows as directed by the federal Clean Water Act. 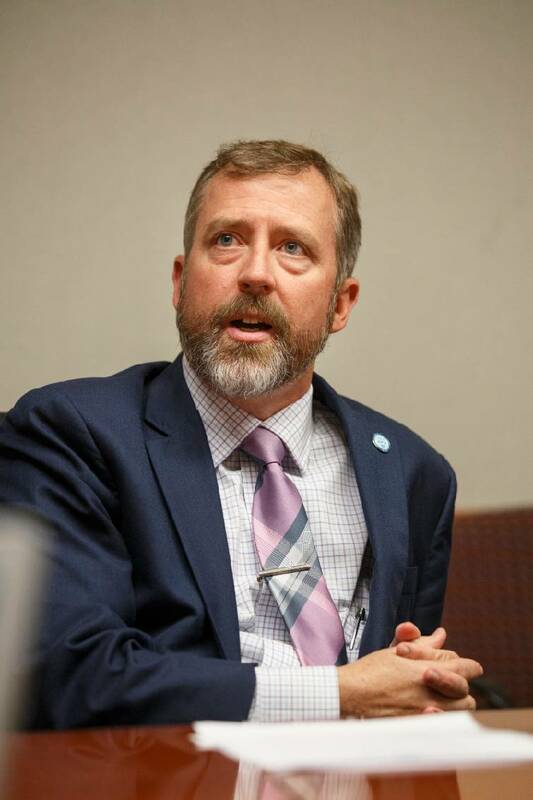 Mark Harrison, executive director of the WWTA, has told north county residents the authority plans to spend $200 million over 20 years to rehabilitate and improve infrastructure, over and above at least $45 million for the sewer plant. 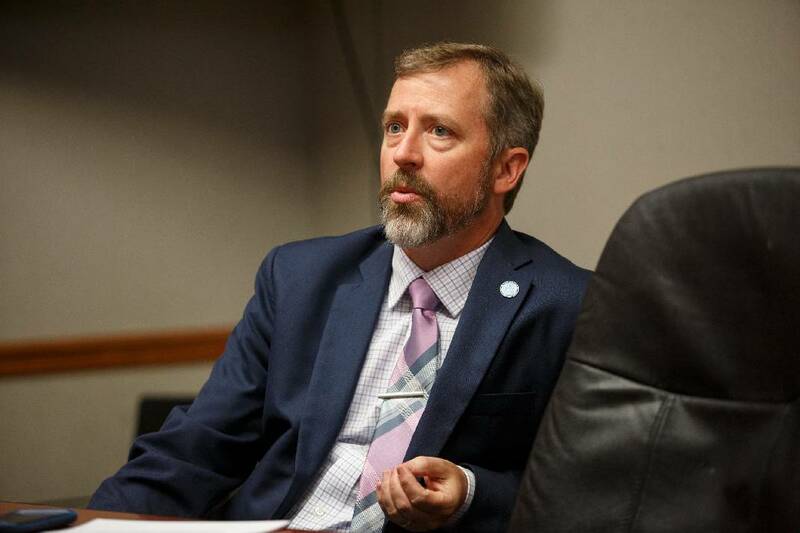 That's going to mean bigger bills for ratepayers, Harrison told Times Free Press reporters and editors Thursday at an editorial board meeting. Exactly how much is under study, he said. The plant's cost will affect the rate calculation. By comparison, Chattanooga residential and business rates have risen nearly 10 percent a year since 2012 to pay for the city's own $250 million Clean Water Act fix. The average 5,000-gallon user in the city saw rates rise from $25.10 a month in 2011 to around $50 today. The WWTA is facing a wall of opposition to the planned wastewater plant in the 7800 block of Mahan Gap Road. The authority says the plant will provide more sewer service in a 20,000-acre area to the north, opening it up for development, and will ease demands on Chattanooga's Moccasin Bend Treatment Plant. The Mahan Gap site is the best of several surveyed because it will allow the greatest use of gravity sewers, reducing the need for pump stations, Harrison has said. If the plant is put somewhere else, WWTA still will have to build a storage tank at Mahan Gap to collect raw sewage, which then will have to be pumped to the plant site at greater cost. Harrison said the public needs to understand that without new sewers, "growth in the county stops or is extremely stifled." The site was chosen because it's in the right place and will be the least costly, he said, although WWTA continues to look at other sites. "No one's pocket is being lined, no one's got any back-room deals," he said. "For all intents and purposes, [the site search] was a blank canvas: Tell us where the plant needs to be." He'd also like to convince neighbors in the 3,500 or so homes within a mile or so of the proposed plant that "it won't be visible, it won't be a nuisance, it won't be noisy." But the residents rejected that message at a rowdy Hamilton County Commission meeting and two positively raucous public meetings. "We're not unreasonable people, we know we need one out here. We're just worried about how it's going to be managed. It's just scary to us to put it among this many homes," said Jennifer McDonald of North Heron Bay, speaking for NHC (North Hamilton County) United for Responsible Growth. She said the neighbors right around the 157-acre site are on septic systems and don't pay sewer bills. Those who do, she said, "probably understand that in order to get it in working order, their bills are going to increase." That's not the issue, McDonald said. The opponents believe the process was rushed and the engineering inadequate. Harrison and WWTA consultants haven't been able to tell residents how the plant would work or what process and chemicals would be used. McDonald has gathered reports of multiple sewage overflows and spills on Signal Mountain, which is a WWTA member. And a weekend sewage spill at the Snow Hill Pump Station is around the ninth so far this year, she added. Harrison said there have been recurring problems at the Snow Hill station because the two 70-horsepower pumps were overwhelmed by the heavy rains this year. Most recently, he said, a piece of metal got into the system and wrecked both pumps. They were replaced with 85- and 115-horsepower pumps, but debris clogged them over the weekend and sent sewage spilling into a creek and across the nearby Champions Golf Course. "They've had all these issues and we're trusting them with $45 million to build a sewage treatment plant on a bay," she said. Contact Judy Walton at jwalton@timesfreepress.com or 423-757-6416.